THE FINAL CHAPTERS: WARNING--I MAY BE HAZARDOUS TO MY HEALTH! I had a sweet new friend call me this morning to catch up. I loved talking with them--sad that I will not have more time to get to know them better since I will be leaving soon. I found myself weepy after that---grieving leaving my sweet friends and Ruston. I am down to one more interim trip to FW--and then my permanent move. I handled my grief--in my normal fashion---I became a spinning top. Today my spinning top became hazardous to my health. The first incident was when Helen & I were cleaning out Dales' workshop and I dropped a chest we were moving on my POOR TOE. Poor Toe---there is only 1/2 of a toenail there currently---fortunately I did NOT drop in on Poor Toe II---there is only about 1/4 toenail on that toe-----Hazard of running---POOR TOES! I will spare you the picture of my Poor Toe! 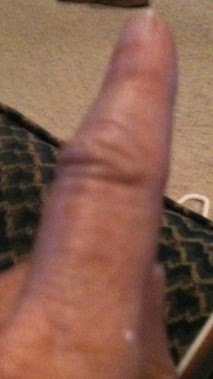 I closed my finger in a piece of hinged lumber that Helen wanted thrown away as I took it to the street. Thankfully it is not my painting hand--since God had me paint a bathroom to ONCE AGAIN show me who the boss is! Fortunately I suffered no more injuries while painting---but I need to go dive between the covers and not tempt fate any further today!